In Winnipeg, 5 days a week, YOU can be Idle No More by supporting local initiatives that are ongoing. Many of our community members volunteer every week, and show kindness, leadership and provide the example that our children need. Always learning, always loving – this is your personal invitation to join the village, spread the word, volunteer as a helper or simply come and be a part of the village we once had coming to life today in 2014. Our waters are under attack and we must come together to strategize actions and create opportunities for education. 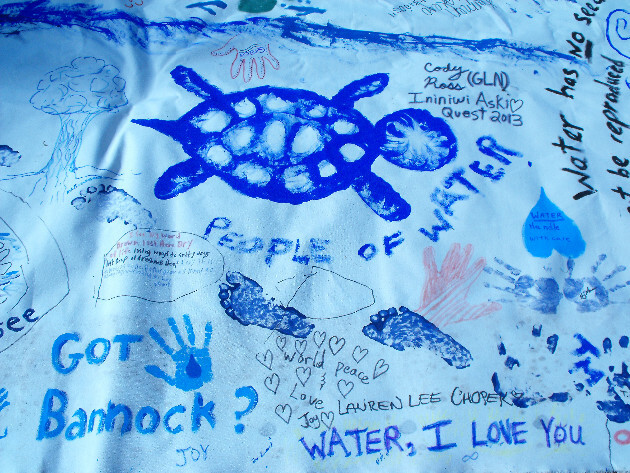 We will meet weekly at Memorial Park Fountain, pray for the water and also gather donations for Got Bannock! We are looking for groups to host each gathering! Join us as we share this Cree healing dance with parks in different areas of our city. Super dad Darryl Buck invites singers and dancers of all styles to join us in bringing healing back to our communities – with a focus on stopping the lateral violence. You can LIKE the FB event by clicking here! Join AYO & the Bell Tower Family as we meet at Selkirk and Powers Each week at 6pm to ring the bell, and role model peace to our community. You can come along, listen to our young people and share the ways that you stop the violence in your day to day actions. Click here to see a Somali community anti violence group in Toronto called Positive Change Toronto. Join the Brain Storm with AYO Politix as we invite candidates who are running for mayor of Winnipeg to answer questions and talk face to face with Aboriginal youth and young Winnipeggers. Click here to see the details of when Paula Havixbeck, Judy Wasylycia-Leis & Brian Bowman are coming down to Neechi Commons – and spread the word. More events and details to be posted to idlenomoremanitoba.com very soon!